Unusual ships, straying away from accepted designs, are being tried in an effort to increase safety and simplify air travel. Some of thef ideas are shown here! 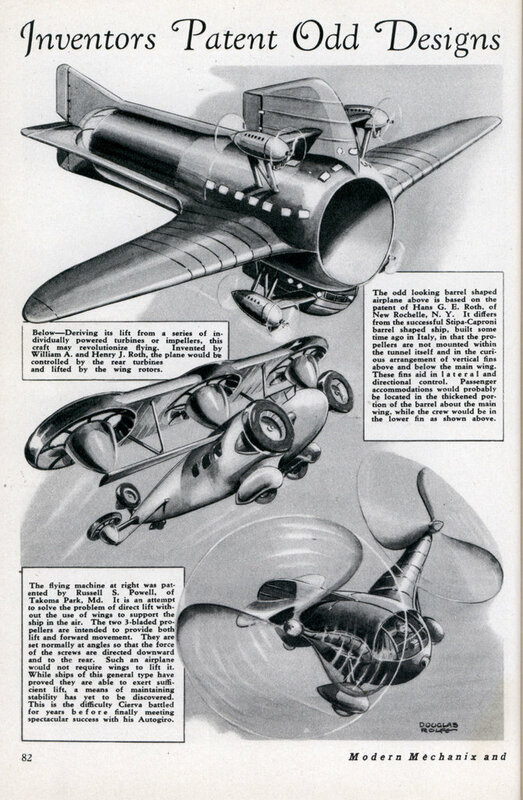 The odd looking barrel shaped airplane above is based on the patent of Hans G. E. Roth, of New Rochelle. N. Y. It differs from the successful Stipa-Caproni barrel shaped ship, built some time ago in Italy, in that the propellers are not mounted within the tunnel itself and in the curious arrangement of vertical fins above and below the main wing. These fins aid in lateral and directional control. Passenger accommodations would probably be located in the thickened portion of die barrel about the main wing, while die crew would be in the lower fin as shown above. Belowâ€”Deriving its lift from a series of individually powered turbines or impellers, this craft may revolutionize flying. Invented by William A. and Henry J. Roth, the plane would be controlled by the rear turbines and lifted by the wing rotors. 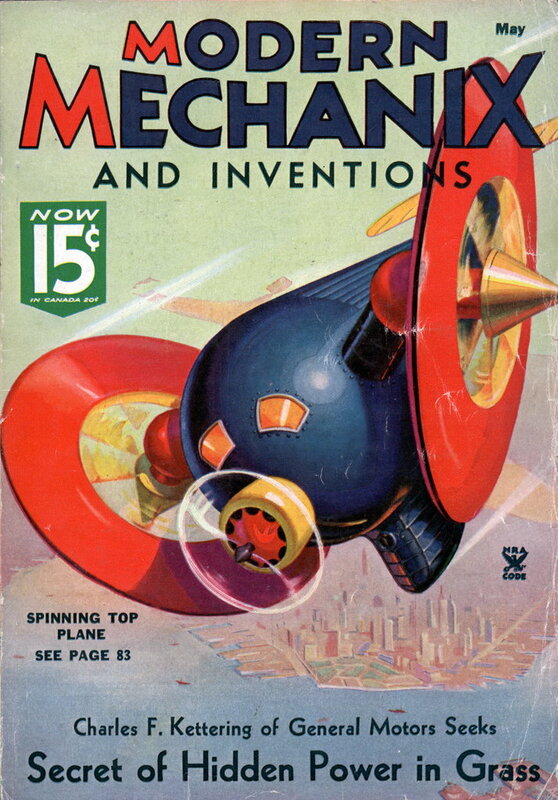 The flying machine at right was patented by Russell S. Powell, of Takoma Park, Md. It is an attempt to solve the problem of direct lift without the use of wings to support the ship in die air. The two 3-bladed propellers are intended to provide both lift and forward movement. They are set normally at angles so that the force of die screws are directed downward and to die rear. Such an airplane would not require wings to lift it. While ships of this general type have proved they are able to exert sufficient lift, a means of maintaining stability has yet to be discovered. This is die difficulty Cierva battled for years before finally meeting spectacular success with his Autogiro. The remarkable “side-wheeler” below has actually undergone tests in France. The spinning rotors supplant usual wings. They both lift and propel the craft. Lateral stability is provided by rotating movement of rotors. The “Spinning Top” plane, illustrated in the drawings above, is the latest idea for the application of the paddle wheel theory now being tested abroad. Like the plane designed by Carl Strandgren (at left above), this ship derives its support from rotating wheels but in this case the wheels are composed of an outer rim around rotating vanes. The vanes are not power driven but rotate freely as in the autogiro. The ship at left, designed by Alexander C h e s s i n and Serge Trey, it intended to improve safe flying. A 12-inch hollow cylinder, 23 feet long forms the leading edge of the wing. Built on the Flettner rotor principle, it routes 7,000 r.p.m. A constant stream of air is directed onto the cylinder by tiny jets to insure continuous lift.